Friday night’s ten-bout fight card staged at the 2300 Arena played out like two different shows rolled into one. Part one was loaded with a series of bone-crushing quickies, and at least two of the five fast kayos should vie for honors as the best knockout of 2017. The second half of the evening consisted of five bouts that went the full limit, but were still full of entertainment value. 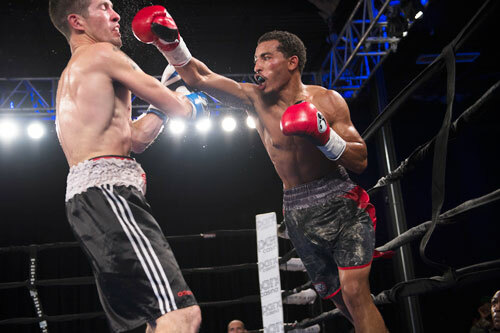 In the main event, junior lightweight Avery Sparrow continued to develop as a prospect, winning his third straight fight, this time against Canadian Joey Laviolette of Nova Scotia. Sparrow started strongly, winning the first three rounds with relative ease. He landed a hard left hook in the third and seemed in total control of the bout. Laviolette woke up in the fourth, and became more aggressive. As he pushed forward, he landed a few good rights and showed some decent power. However, the visitor never threw or landed enough to construct much of a rally. Sparrow took a breather in the third, and let the fourth slip from his grasp by just a hair, in my opinion. However, the North Philadelphian was back in charge by round six, and kept his work rate up and is boxing skills flowing. As a result, Sparrow, on my card, took the remaining rounds of the fight. After eight full rounds, Sparrow clearly earned the decision, but the tally turned out closer than expected. Judge Dave Braslow saw the bout a surprising 76-76 draw. 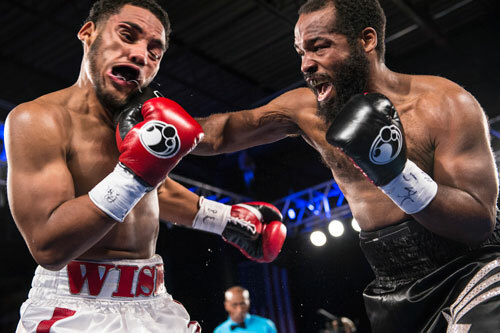 Luckily, Anthony Lundy and James Kinney scored the fight comfortably in Sparrow’s favor, 80-72 and 79-73, respectively. My tally was 78-74. It was a good performance by Sparrow, 8-1, 3 KOs, and further proof that he has a future at 130 pounds. His last four wins have almost completely erased his lone loss, a confounding, last round, DQ to Jerome Rodriguez in 2015. That was a bout that Sparrow should have won, but seemed insistent on losing. 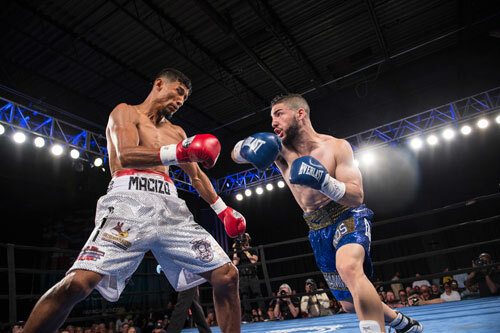 He flaked out on that night, fouling out while well ahead in the bout, but was clearly on point Friday against Laviolette, 6-1, 4 KOs, and dished the Canadian his first professional loss. 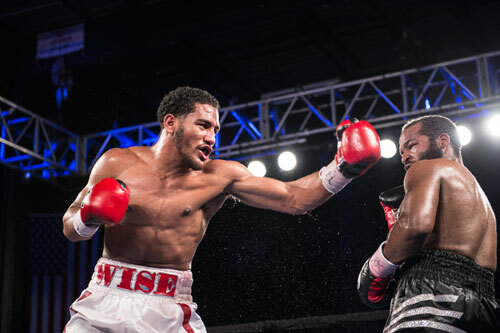 The co-feature bout, an all-North Philly crossroads battle between Isaiah Wise and Fred Jenkins Jr., was the most intriguing of the show, going in. From the moment their names were on the contract, the fight appeared to be a good opportunity for the rising Wise, and another tough hurdle for the declining Jenkins. So, I was sure that Wise would be the winner, and offered that opinion freely as the preliminary bouts transpired on the night of the fight. However, as is often the case, sentimentality began creeping into my head as the opening bell approached. So, when I was asked, just before the bell, who I thought would win, I opened my mouth and the word “Fred” came out. I really like both guys, but I’ve followed Jenkins closely for longer. So, I guess I was secretly rooting for him. Well, it didn’t take long for reality to settle in. In round one, Wise jumped on Jenkins and painfully dropped him twice. 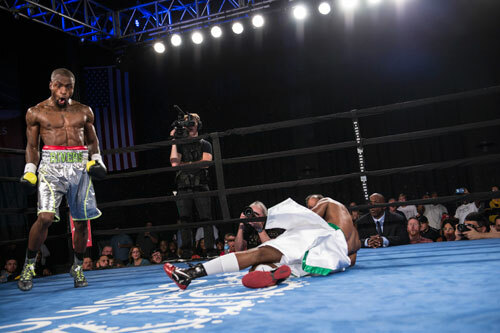 Hard rights were responsible for both knockdowns, and it appeared that Jenkins would not survive the first round. But Jenkins is a tough and well-schooled fighter who was practically born in the gym. So he got up both times and fought back hard. 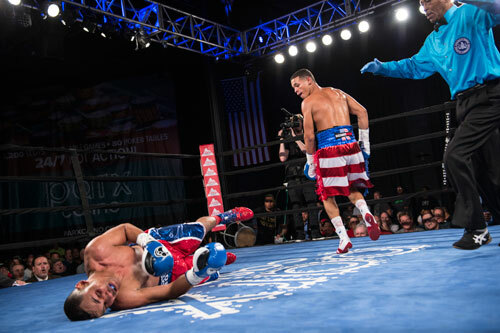 Both boxers made the fight a good one, but Jenkins could not keep pace with the younger and fresher Wise. 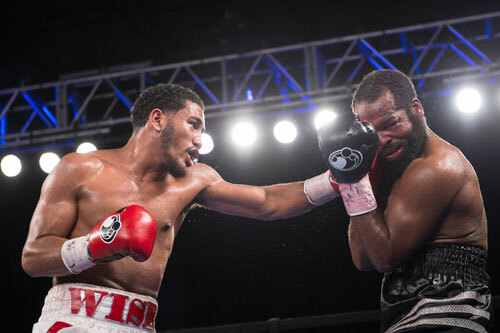 Isaiah boxed well, kept throwing punches and endured the many return shots that Jenkins landed. 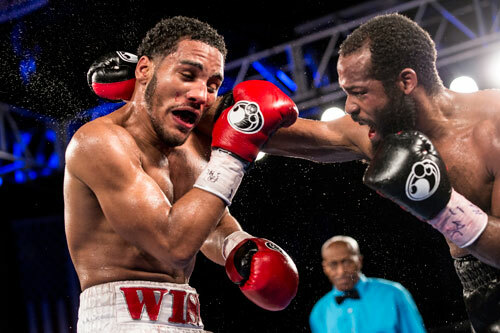 Wise kept winning rounds while Jenkins kept trying to turn the fight and keep his career alive. There were numerous two-way exchanges, but each time, no matter how well Jenkins landed, Wise had the answer, and always punctuated each volley with a telling shot that clearly won him the trade. As is the case with many aging fighters, Jenkins felt every punch that crashed against his head and his body. He grimaced; he wavered, but he always kept fighting. 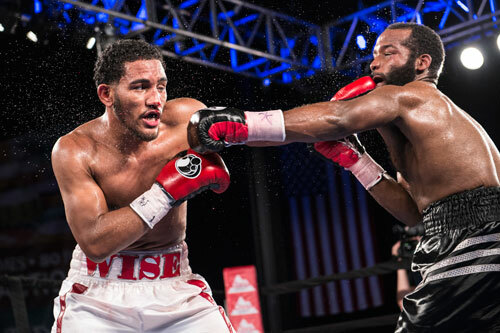 At the end of six grueling rounds, Wise won the decision by scores of 60-52, 59-53 and 57-55. I gave Wise every round plus two extra points for the early knockdowns, and scored it 60-52. 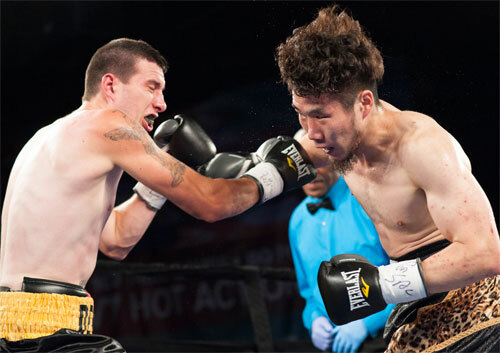 In a sloppy lightweight four-rounder, swung in just before the two main bouts, Vinnie DeNierio, 2-2, Elmira, NY, won a majority decision over West Philadelphian Jae Ho Kim, 6-5-1, 2 KOs. Southpaw DeNierio awkwardly swept the first three rounds on my card before Kim rallied to take the final three minutes. 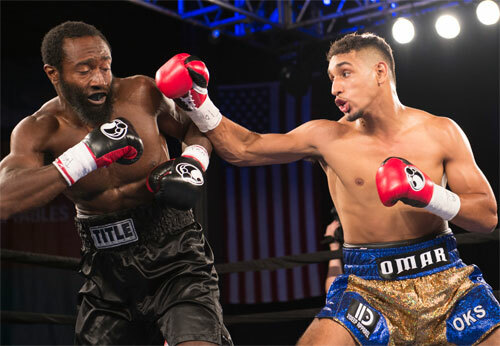 Judge James Kinney scored the fight a draw, 37-37, but Alan Rubenstein and Antony Lundy overruled with their 40-36 and 39-37 scores for DeNierio. NJ junior welterweight Julian Rodriguez, 16-0, 10 KOs, remained undefeated with a unanimous decision over Mexican Dario Ferman, 14-3, 11 KOs. After five straight knockouts opened the show, this was the first bout to involve the judges. The action was clear cut, and after six full rounds, all three judges scored the fight 59-55, in favor of Rodriguez. My score was the same. 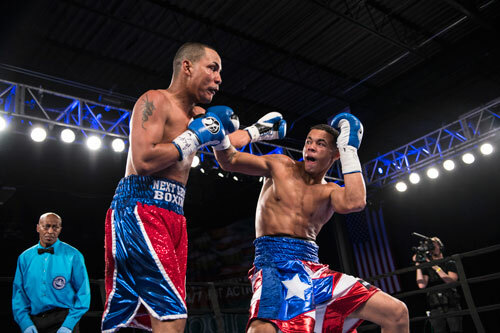 Baby-faced southpaw Victor Padilla, 4-0, 4 KOs, Vieques, PR, made short work of San Juan's Javier Garcia, 8-16-2, 3 KOs. Padilla controlled the first round before clobbering Garcia with an overhand left that landed as the bell to end the round sounded. Garcia crashed to the deck, and referee Ronald Bashir waved the fight over without a count. The time was 3:00 of round one. Clean and devastating, Padilla’s one-punch KO will likely be in the running for 2017’s Knockout of the Year. 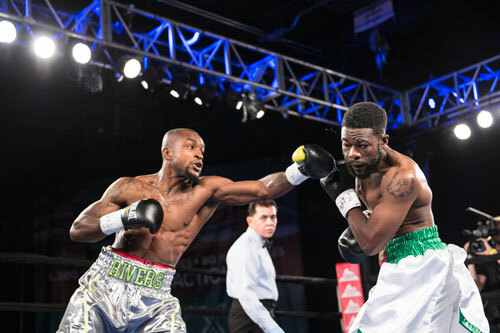 It took North Philly junior welterweight Marcel Rivers, 3-0, 2 KOs, almost four rounds to land a telling shot on wily old Atlantic City pro Osnel Charles, 11-18-1, 1 KO, but when he did, he made it count. Charles stole the opening round before Rivers began pressing more effectively in the second. 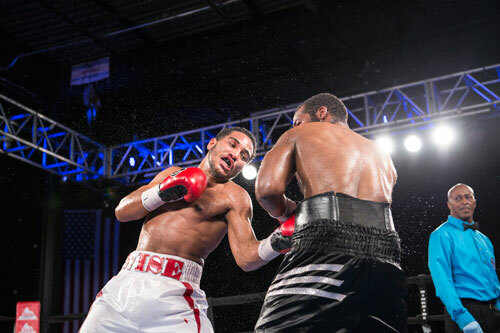 Finally after mostly chasing Charles, Marcel nailed Osnel with an explosive right hand in the fourth, as the closer-than-expected bout wound down. It was a picture-perfect punch (another KO of the Year candidate) and Charles crashed to the mat. Referee Benjy Esteves didn’t bother to count as Charles laid motionless for several frightening seconds. The popular and better-than-his-record-indicates journeyman has won just two of his last seventeen bouts, and has seen more than enough ring action in his see-saw career. It’s none of my business, but I hope to only see Osnel Charles outside the ring from now on. The time of the knockout was at 1:41 of the fourth. 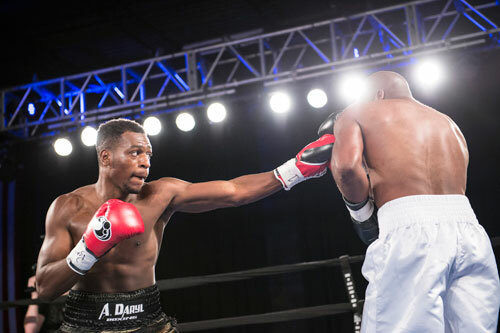 Germantown junior middleweight Elijah Vines, 5-0, 5 KOs, added another quick kayo to the night’s collection with a stoppage of Ishmael Altman, 0-1-1, Arapahoe, NC, at the end of round one (3:00). 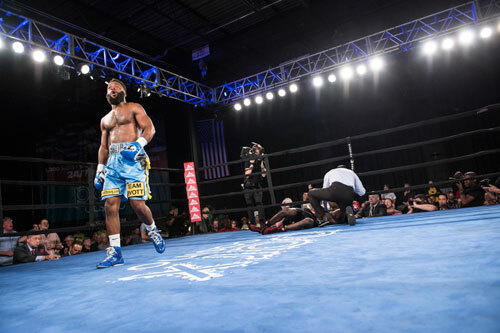 Vines dropped his opponent twice, first with a left hook-right hand combo, and then with a single right rocket, before the bout was stopped in the corner, prior to the start of the second round. 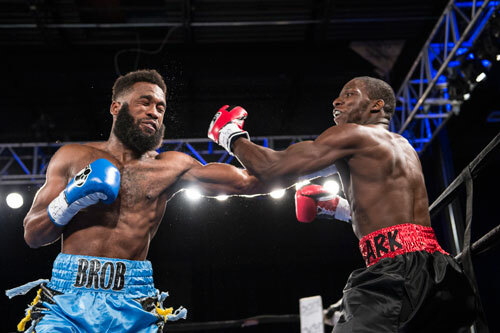 Super middleweight Brandon Robinson, 6-1, 5 KOs, Upper Darby, PA, dropped Brandon Clark, 2-1, 1 KO, Columbus, OH, twice in the opening round, and scored a TKO at 2:07 of the first. 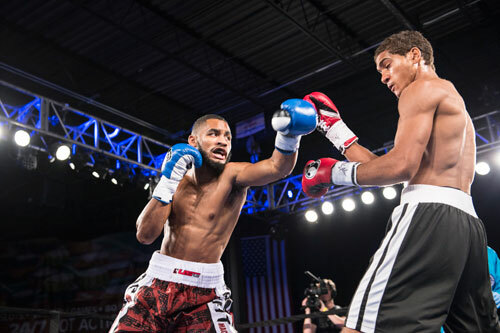 Robinson has been impressing with his two-fisted power displays of late, scoring showy knockouts in his last four bouts. 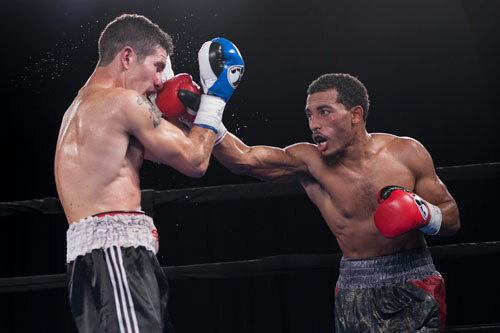 The show opened with Shirley, NY middleweight, LeShawn Rodriguez, 6-0, 5 KOs, blasting out Floridian Fadoul Louis, 3-4-2, 1 KO, with a left-right combination at 2:02 of round one. 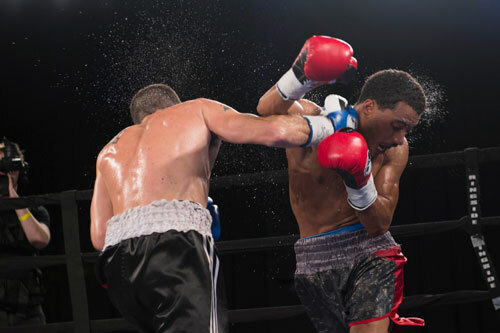 In the walkout bout at the end of the night, middleweight southpaw Omar Kabary Salem, 1-0, made a successful debut against North Philly's Leon DeShields, 0-1. 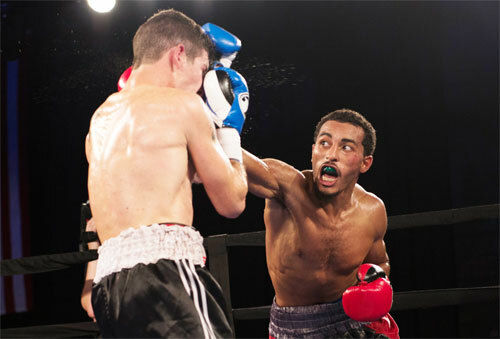 Salem scored a knockdown in the second, and went on to win a unanimous decision by three scores of 40-35. 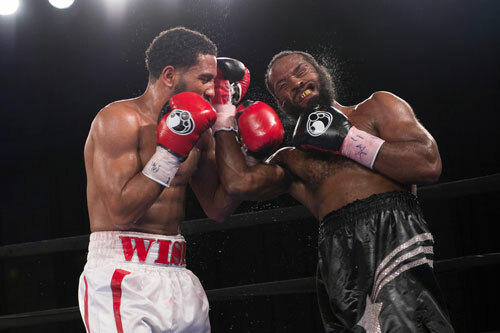 The show was promoted by Peltz Boxing, BAM Boxing, Joe Hand Promotions and Raging Babe, and drew a live crowd of 1,009.